When you have pets, stains and odors can sometimes become a constant battle to control. Nature’s Miracle Stain and Odor Remover can be a helpful and effective solution. Nature’s Miracle is “guaranteed to eliminate all stains and odors.” It is an enzymatic cleaner that is safe to use on carpets, floors, furniture, areas where your pets live and sleep and more. It can also be used for accidents in the car. I use Nature’s Miracle in my household for tasks such as cleaning out litter boxes and cleaning up cat vomit and other stains. I’ve found it to be an effective solution though I’ve never tried to use it on old or deep-set stains or odors. It leaves behind a citrus-like scent which tends to linger for a short time after use. 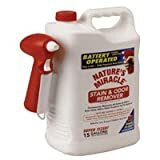 Who could benefit from Nature’s Miracle Stain and Odor Remover? Nature’s Miracle Stain and Odor Remover can be used for virtually any stain so it would be useful in any household. However, by nature of its enzymatic action, it is particularly useful in homes with pets which are likely to have urinary accidents. These might include homes housing puppies that are not yet fully house-trained, cats or dogs that urinate in inappropriate places or dogs and cats that suffer from urinary incontinence. The enzymatic cleaning action of Nature’s Miracle Stain and Odor Remover makes it an appropriate choice for cleaning urinary accidents. Without the use of these enzymes in the cleaning process, the odor of urine can remain trapped in fabrics and can attract the pet to continue to urinate in the same area because of the lingering scent. Nature’s Miracle Stain and Odor Remover removes the scent of the urine so the pet no longer smells it in the area and will not become confused by the smell of lingering urine. Of course, it is also useful for cleaning other pet accidents, such as vomit, feces, or even blood. Guaranteed to permanently eliminate all stains & odors – even urine odors other products fail to remove. Removes all organic stains and odors, including foods, blood, vomit, feces, grease, dirt, grass, smoke, and perspiration. Will also work on old and deep-set stains and odors. For use on carpets, floors, furniture, clothing, cages, litter boxes, and all pet living and sleeping areas. 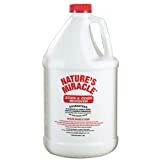 Nature’s Miracle is the number one selling pet accident stain and odor remover. Guaranteed to remove pet stains and odors, even old urine odors trapped deep in carpets. 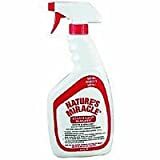 Nature’s Miracle removes all organic stains and odors, including foods, blood, vomit, feces, grease, dirt, grass, smoke, and perspiration. For use on carpets, floors, furniture, clothing, cages, litter boxes, and all pet living and sleeping areas. Safe to use around pets and children. 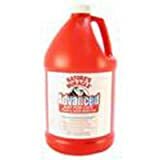 Unconditionally guaranteed to remove urine stains and odors from both dogs and cats. The completely natural enzymes convert odors into harmless substances. Also can be used to remove perspiration, mildew and smoke odors from clothing, furniture and vehicles. Less water and more enzymatic action make the cat formulation perfect for the removal of odors and stains caused by cat spray, urine, vomit and feces. If you are not completely satisfied, mail receipt to the manufacturer and they will refund your money. No questions asked. Help keep your home clean and smelling fresh! Find more Natures Miracle Stain and Odor Remover products on Amazon!